Commissioned on February 14, 1942, the light anti-aircraft cruiser USS Juneau (CL-52), named after the capital city of Alaska, first saw ser­vice in the Carib­bean, where it per­formed block­ade patrol in early May off Marti­nique and Gua­da­loupe Islands to pre­vent the escape of Vichy French Naval units. On August 22, 1942, the cruiser departed for the Pacific Thea­ter assigned with providing pro­tec­tive screening and es­cort ser­vices for, as it happened, the carriers Hor­net, Wasp, and Enter­prise. On arrival, it was in­volved in a num­ber of naval engage­ments during the months-long Guadal­canal Cam­paign (August 7, 1942 to Febru­ary 9, 1943), the first major offen­sive by Allied forces against Japan. On this date in 1942 the Juneau was cut in half by one of three tor­pedoes fired by Japa­nese sub­ma­rine I‑26. Two days earlier the cruis­er had been in a fierce battle and had been hit by a Japa­nese torpedo in the for­ward fire room. Badly damaged, steaming on one screw at 13 knots, down 12 feet by the bow, the Juneau charted course with other battle-damaged U.S. war­ships for the Allied rear-area base at Espiritu Santo in the New Hebrides. When tor­pedoed the second time at or near its am­mu­nition maga­zines (roughly in the gen­eral area where it had been pre­viously hit), the cruis­er went down in 20 seconds, taking with her four of five Sulli­van brothers in the ini­tial explo­sion. Despite being wounded, George Sulli­van, the fifth brother, made it onto a raft where he sur­vived for several days before suc­cumbing to his wounds and ex­haustion or to a shark attack when he left the rela­tive safety of the raft. Of a crew of nearly 700 men, only 10 survived the Juneau’s final mis­sion when plucked from the water eight days later by a PBY Cata­lina search air­craft. The “Fighting Sulli­van Brothers,” as they became known, had enlisted together eleven months earlier, insisting that they serve aboard the same ship. The brothers received Purple Heart Medals post­hu­mously. Presi­dent Franklin D. Roose­velt sent a letter of con­do­lence to the Sulli­van’s parents, and Pope Pius XII sent a rosary along with a mes­sage of regret. 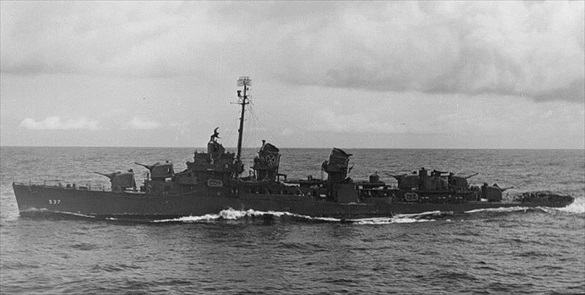 The Sullivans (DD-537), a U.S. Navy destroyer, was named in honor of the five brothers in April 1943. 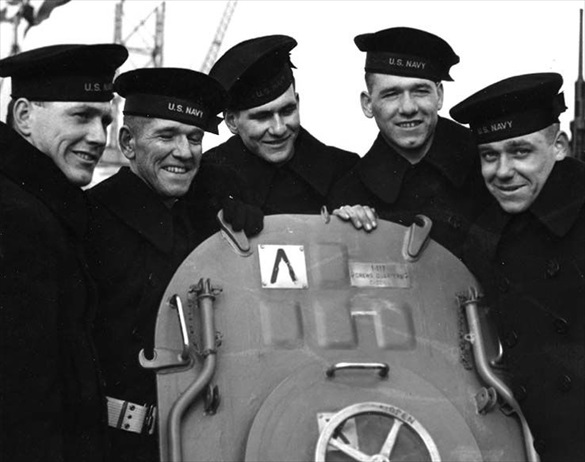 Above: Sullivan brothers on the USS Juneau, Febru­ary 14, 1942: Joseph (left), Fran­cis, Albert, Madi­son, and George. Aged 20 to 27, the Sulli­vans enlisted in the U.S. Navy on Janu­ary 3, 1942, with the stipu­la­tion that they serve together. The brothers lost their lives when their ship, USS Juneau, was sunk by Japa­nese submarine I‑26 during the Naval Battle of Guadal­canal on Novem­ber 13, 1942. This picture of the five brothers was turned into war­time poster with the caption: “They did their part.” As for sub I‑26, just over two years later it dis­appeared east of Leyte in the Philip­pines, taking with it the distinc­tion of having sunk more than 51,500 tons, the third highest scoring Japanese submarine in terms of tonnage sunk. Above: USS The Sullivans (DD-537) off Ponape, Micro­nesia, May 2, 1944. The loss of the five Sulli­van brothers is reput­ably the greatest military loss by any one Amer­i­can family during World War II. The Sullivans, whose keel was laid down on Octo­ber 10, 1942, even before the tragedy, was the first ship com­mis­sioned in the Navy that honored more than one per­son. The Fletcher-class destroyer was launched on April 4, 1943, and saw ser­vice in the Pacific with Fast Carrier Task Force 58, part of Adm. Ray­mond Spru­ance’s Fifth Fleet. The ship, recipi­ent of four battle stars for World War II ser­vice and, since 1986, a National His­to­ric Landmark, is berthed in Buffalo, New York, and now serves as a memorial open to the public.